Star Wars: Could the next war be fought in space? America has set up a hotline with China to make sure an accidental satellite collision doesn't spark a full blown space war. China is known to have developed weapons capable of destroying spacecraft as they orbit around the planet. If an American satellite was suddenly wiped out, officials could easily mistake the mishap for an act of war. The new hotline will allow the rival superpowers to get in touch following a space accident, to avoid the situation escalating. Frank Rose, US assistant secretary of state, told the Financial Times that it was often difficult to cut quickly through Chinese bureaucracy and reach the right person. "China is developing a full spectrum of anti-satellite capabilities,” he added. "We’ve made it clear we don't believe it’s in anyone’s interest to engage in a space arms race." Any satellite orbiting earth faces a massive risk of destruction, due to the huge amount of orbiting debris. America is known to have communications satellites in space, but it is rumoured to be planning something much scarier. X-37B spacecraft: What is this strange craft doing up there in space? The US recently sent its top-secret X-37B 'space plane' on another mystery mission which is feared to be part of an ominous Star Wars weapons programme. So far, the space plane has spent a massive 1,367 days - almost four years - in space during three classified missions. Boeing has been awarded a $6.6m contract to design a cheap, reusable mini shuttle that can launch military satellites. The small, planelike craft is known as the XS-1 program—short for 'eXperimental Spaceplane 1', and could blast off in 2019 on its first test mission. It is hoped the craft could quickly launch small satellites that could defend against the growing threat of Russian and Chinese space weapons. The small, planelike craft is known as the XS-1. It is hoped the craft could quickly launch small satellites that could defend against the growing threat of Russian and Chinese space weapons. The reusable first stage launch vehicle will be capable of carrying and deploying an upper stage to launch small satellite payloads of 3,000 to 5,000 pounds (1,361 kg to 2,268 kg) into low-Earth orbit. The booster would then return to Earth, where it could be quickly prepared for the next flight using methods similar to an airline jet. XS-1 could 'create a new paradigm for more routine, responsive and affordable space operations,' according to DARPA, the military research arm heading the project. The XS-1 is an airplane-like vehicle that can fly to the edge of Earth's atmosphere and quickly boost small satellites into orbit, and then land, refuel, load up another satellite, and take off again within 24 hours. 'In an era of declining budgets and adversaries' evolving capabilities, quick, affordable, and routine access to space is increasingly critical for both national and economic security,' DARPA said in a press release. However, it has remained tight lipped about the latest contract. 'The Boeing Co., Huntington Beach, California, has been awarded a $6,587,447 modification (P00004) to previously awarded HR0011-14-9-0005 (Other Transaction), for the Experimental Spaceplane (XS-1) program,' the announcement of the deal says. 'The additional tasks, identified as Phase IB, will continue the development of the XS-1 demonstration concept, substantiating identified core component technologies, mitigating risk, developing a Technology Maturation Plan (TMP), and performing several demonstration tasks. Boeing must complete its XS-1 design and test its basic technologies before August 2016. DARPA wants an XS-1 prototype to perform a realistic trial mission no later than 2019. After that, the Pentagon could decide to build XS-1s for regular use. Following the launch, the craft, which flies itself, simply returns to Earth. 'Developing a vehicle that launches small payloads more affordably is a priority for future U.S. Defense Department operations,' said Steve Johnston, director of Boeing's Phantom Works Advanced Space Exploration division when the oritinal funding was revealed. The upper stage can launch small satellite payloads of 3,000 to 5,000 pounds (1,361 kg to 2,268 kg) into low-Earth orbit. The firm was initially given a $4 million preliminary design contract, to work on a reusable first stage launch vehicle capable of carrying and deploying an upper stage to launch small satellite payloads of 3,000 to 5,000 pounds (1,361 kg to 2,268 kg) into low-Earth orbit. 'Our design would allow the autonomous booster to carry the second stage and payload to high altitude and deploy them into space. 'The booster would then return to Earth, where it could be quickly prepared for the next flight by applying operation and maintenance principles similar to modern aircraft.' said Will Hampton, Boeing XS-1 program manager. DARPA wants the new spaceplane to be able to boost a two-ton satellite into space every day for 10 days straight for less than $5 million per flight. The craft is set to be larger than the X-37B robotic spaceplanes that Boeing built for the Air Force. Masten Space Systems and Northrop Grumman had also drawn up XS-1 blueprints. DARPA awarded the three firms $4 million apiece to do that preliminary design work. Boeing also enlisted Washington State-based rocket start-up Blue Origin to help with the XS-1's motor, ans is believed to be planning to use Blue Origin's BE-4 to power the XS-1. Capable of producing more than half a million pounds of thrust, the BE-4 is amonster of an engine. Earlier this year the US Air Force's top secret X-37B space plane was been caught on camera by a team of amateur astronomers. The unmanned plane launched atop a United Launch Alliance Atlas V on May 20 on its fourth mission, but most of the details about its flight remain classified. The latest image, however, provides new insights into the spacecraft's activities and has fuelled speculation that X-37B may be a spy plane. The U.S. Air Force's unmanned X-37B space plane has flown four secret missions to date. Each time it has carried a mystery payload on long-duration flights in Earth orbit. The spacecraft looks similar to Nasa's space shuttle but is much smaller. The X-37B is about 29ft (8.8m) long and 9.5ft (2.9 m) tall. It has a wingspan of just less than 15ft (4.6 m). At launch, it weighs 11,000lbs (4,990kg). The craft is taken into orbit on a rocket but lands like the space shuttle by gliding down to Earth. While it's main mission payload is a mystery, Nasa has revealed it has a materials experiment aboard. The Planetary Society is tagging along with a solar-sail demo. Ten CubeSat nanosatellites are also taking a piggyback ride into orbit. 'It's in a lower orbit than normal … had us confused for a while, as I thought it would be the standard operating orbit,' tracker Greg Roberts told Space.com. Roberts captured an image of the space plane in two-second–long exposures just a few weeks after launch. Its inclination of 38 degrees is the lowest of the X-37B program, with the first mission flying at an inclination of 40 degrees. It also features the lowest initial altitude of the four X-37B launches at 198 miles (318km). The previous low was OTV-2, at 205 miles. The low-altitude flight profile may be a indication of test for a new propulsion technology. 'One thing that OTV-4 has in common with each of its predecessors is that its ground track nearly repeats after every 31 revolutions, which takes two days,' Toronto-based Ted Molczan told Space.com. He added that this could be in support of a spy mission, to permit targets to be revisited frequently. Other theories have for the spaceplane have ranged from it being a space bomber, to a clandestine probe on a mission to 'take out' spy satellites. The mystery test vehicle — essentially a technology test bed — is designed to orbit the Earth and then land like one of Nasa's old shuttles. While it's main mission payload is a mystery, Nasa last month revealed it has a materials experiment aboard, while the Planetary Society is tagging along with a solar-sail demo. The space plane is a spy plane: The leading theory appears to be that the unmanned space plane is a shuttle-shaped surveillance vehicle. It could be a space bomber: This is the least likely theory, according tot Seven Aftergood, a secrecy expert at the Federation of American Scientists. He claims the US doesn't need this capability. It is on a mission is to 'take out' satellites: This activity would be easily traceable, making it unlikely to stay a secret. The X-37B deploys spy satellites: Instead of destroying them, the theory suggests that the space plane's orbit matches up to where deployed satellites would work best for spying on other countries. Called LightSail, it uses a propulsion system that uses the pressure of photons from the sun, a technique known as solar sailing. Nine other CubeSat nanosatellites are also taking a piggyback ride into orbit. The space plane - one of two of the same design - is operated robotically, without anyone on board, and is reusable. It is 29ft long — about one-fourth the size of a Nasa shuttle. The longest X-37B flight lasted about 675 days; touchdown was last October. There's no official word on exactly how long this one will stay up, although report suggest it will return to Earth in mid-to-late 2016. In an unprecedented disclosure, last month month the Department of Defense did reveal some details about the X-37B's main mission. '[We] are investigating an experimental propulsion system on the X-37B on Mission 4,' Captain Chris Hoyler, an Air Force spokesman, told Space.com. 'The Air Force Rapid Capabilities Office will also host a number of advance materials onboard the X-37B for Nasa to study the durability of various materials in the space environment,' Hoyler added. He added the vehicle's mission 'cannot be specified' but that it will enhance 'the development of the concept of operations for reusable space vehicles'. It is intended to improve performance of the units onboard Advanced Extremely High Frequency (AEHF) military communications spacecraft, officials claim. AEHF satellites' Hall thrusters are 4.5-kilowatt units that use electricity and xenon to produce thrust for moving satellites in space. The benefit of using electric propulsion is that its xenon fuel weighs much less than traditional hydrazine. This technology could help in the development of technologies to control satellites with better accuracy. However, experts claim that refining an advanced manoeuvring thruster is probably just a small part of the vehicle's true mission set. One leading secrecy expert previously told DailyMail.com that the drone is 'very likely' be used to test technologies that will increase spying capabilities of the US. 'The US government has a bottomless appetite for sensitive information,' said Steven Aftergood, a secrecy expert at the Federation of American Scientists. 'As powerful as our intelligence satellites may be, they also have their limitations - most notably the limitations imposed by their orbital parameters. The X-37B space drone, otherwise known as the Orbital Test Vehicle, is blasted into orbit by a rocket. However, it lands using a runway like a normal aircraft. The X-37B is too small to carry people onboard, but does have a cargo bay similar to that of a pickup truck, which is just large enough to carry a small satellite. The X-program has bounced between several federal agencies, Nasa among them, since 1999. The plane has been in space for a total of 674 days, far more than its two previous flights which lasted 225 and 469 days. The program's first mission launched in April 2010 and landed in December that year. 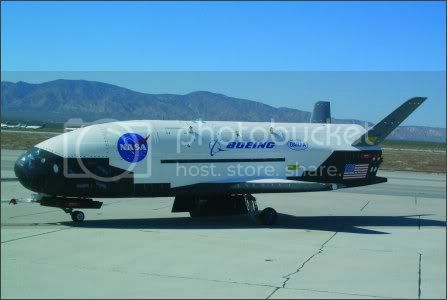 The second space plane took off on March 2011 and came back to Earth in June 2012. According to X-37B manufacturer Boeing, the space plane operates in low-earth orbit, between 110 (177km) and 500 miles (800km) above earth. By comparison, the International Space Station orbits at about 220 miles (350km). Its the little buggers we need to find out about. solar powered nanodrones capable of delivering lethal or otherwise chemicals or plagues. THE OPPOSITE POINT OF VIEW! CNN last night aired a major propaganda piece promoting the US military industrial complex goal of frightening the American people so they will hand over even more $$$$ to pay for this massive space war machine. As the US routinely does the Pentagon plays 'poor me' claiming that Russia and China are out to get us. They make it sound like the US is under threat and thus we need to pump even more money into our already massively expensive military space program. The fact is that the US is way out in front of the space warfare arms race. Russia and China have for more than 20 years been annually going to the United Nations pleading with the US to join them in serious negotiations for a new treaty called Prevention of an Arms Race in Space (PAROS). Each year the US blocks treaty negotiations claiming there is 'no problem' and thus no need to create a treaty to prevent war in space. The US-based aerospace industry (led by Lockheed Martin, Boeing and Raytheon) has long known that if the US refused to negotiate the treaty, Russia and China would be forced to respond to the US Space Command's Vision for 2020 that states the Pentagon will 'control and dominate' space and will 'deny' other nations 'access to space'. Thus a new arms race is guaranteed and the profits to be made from such a new round in military conflict would bear unimaginable profits for the aerospace industry. The history of America is replete with exaggerations of 'enemy' power while the poor old USA is dragging along behind. This strategy was used to over sell the American Indian 'threat' during the late 1800's, over hype the Russian missile capability during the Cold War, and claim that Iraq had 'weapons of mass destruction' before the US 'shock and awe' attack in 2003. At the end of the CNN propaganda piece Space Command officials make the outrageous claim that the US has no offensive assets in space while 'our adversaries' have weaponized space. There should be no doubt that the corporate dominated media today is essentially nothing more than the mouth piece for the US military empire. The fact that this puff piece on a major news network interviewed not a single critic of the US's claim to be the 'Master of Space' speaks volumes. Washington (CNN)Since man first explored space, it has been a largely peaceful environment. But now US adversaries are deploying weapons beyond Earth's atmosphere, leading the US military to prepare for the frightening prospect of war in space. CORRECTION: This story has been corrected by the MILINCOM to more accurately reflect the size, age and budget of the Pentagon's space efforts.